This seasoned bunch is a professional variety band based in Atlanta that's able to accommodate venues large and small since 1998. Individually these musicians are exceptional in their gift and trade, collectively they create the eclectic sounds of Enturaj. This band can transition from a big band with horns to a jazz ensemble which determines your price. YOU CHOOSE WHAT WORKS FOR YOU. With such diversity it will be easy to remember this band for their energy, enthusiasm and the ability to leave listeners wanting more. 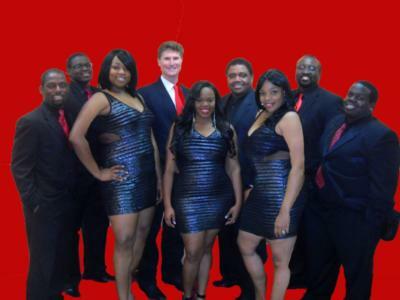 Their performances are riddled with show stopping renditions of Top 40, Funk, Pop, Soft Rock, Motown, Blues, R&B and just when you think they're done they switch gears to Jazz or Swing. Perfect for corporate events and high energy stage shows to wedding receptions and private parties to concert venues-GREAT REFERENCES COME ALONG WITH THIS BAND. The variety of our comprehensive song list allows us to satisfy any and all audiences. We learn, rehearse and perform requests to be added memories to special occasions. Enturaj can also service venues with DJ'd music before, during breaks and after the live performance for continuous listening pleasure. When asked how they classify themselves in this music game they state "we're simply a group of people that enjoys entertaining groups of people." Emceeing adaptations will be made at the client's discretion, as well as band size, instrumentation and acoustical levels to accommodate any facility. Enturaj will be sure to make every event memorable. We coordinate all of the details with you beforehand to make sure everything runs smoothly. If your function requires that special and memorable additive that epitomizes class, style and sheer talent, Enturaj is definitely the remedy. Enturaj is the best band a bride could ask for! They were more than accommodating from day one! It was an instant connection! Stacia has been in constant contact with me, ensuring me along the way. She is very personable and has a calming effect, allowing me to relax. She continued to give me immediate feedback, advice, encouragement and a listening ear. What more can you ask for! Enturaj even went above and beyond by rehearsing one of my favorite songs. I was so impressed that I have included it as my "second" first dance! My guests were equally impressed and many have been asking for business cards! My evening would NOT have been a success without Enturaj! Enturaj was an amazing band. 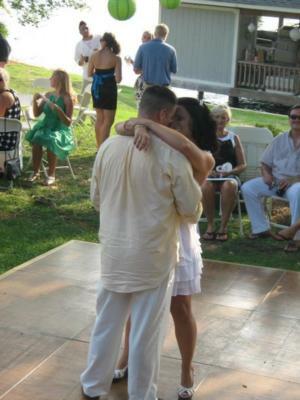 They worked with my daughter and her fiance to insure that everything was just as they wanted. Enturaj was able to keep the dance floor full the entire evening. Our guest commented on what an amazing band. They even accommodated a friend of the happy couple who wanted to sing a special song for them. Even our photographer left later than planned and commented that band made her want to stay!!! Thank you Enturaj for making our daughter's wedding reception fun for everyone!!! We loved the music and the energy Enturaj brought to our wedding reception. From the start, Stacia asked us a lot of questions to make sure the music would fit the tone and style of our reception, and it did. A lot of attention to detail and above all, a great sound. Enturaj was definitely a hit! ENTURAJ was great!!! They kept us dancing all night long. They are consumate musicians and performers who know how to keep the energy up and the people jumpin'. They were a complete joy to work with in arranging the details of the event and were very proactive in making sure we got what we were looking for in our dance party band. I would 100% recommend them to anyone looking for great talent, great music, ease of arrangements, and no-stress perfection. Enturaj was great! They helped me with all the requests that my mother-in-law and I came up with for my wedding reception. They also managed to get in songs from all different kind of genres that I told them I liked. Stacia (my band contact) was very organized and was so easy to work with. I had people coming up to me at the reception asking where I found them! I would definitely suggest them to anybody that is looking for a band They will get the people at your event up and moving!!! At the last moment, I was placed in charge of finding a group literally 2 weeks before the party, I also had the limitation of living in Washington, DC and planning a party that was hosted in Savannah, GA. Even though Enturaj is based out of Atlanta, they made it work. Enturaj assisted me greatly and the event went smoothly as though it was planned for several months! They performed for my father's retirement party which ages ranged from late 70's to teenagers. Every set chosen was enjoyed by all ages which is very difficult. In all, I'd highly consider this group as their covers are great and their original music is just as impressive! Enturaj played at my recent wedding reception. I had never used Gigmasters before, therefore I was a little skeptical about hiring a band that was unfamiliar. They were AWESOME! The band was SO professional and accomodating. They worked well with the crowd and found a way to get everyone dancing. I will use them again for upcoming events and gladly recommend them to others! They are a fabulous band, especially for the cost. The band was great they socialized well with the quest. The music was super. We made a great decision to invite Enturaj to complete our engagment. I booked Enturaj for an Engagement Party. They were so pleasant to work with; it made the planning process a breeze. Enturaj’s performance was nothing less than AMAZING! They are extremely talented and put on a wonderful show! I have had numerous people asking for their contact information for their own upcoming events. I would recommend this band 110%!!! They are incredible! Great communication and fun to work with! Please note Enturaj will also travel to Morrow, Stockbridge, Ellenwood, Forest Park, Jonesboro, Atlanta, Conley, Decatur, Riverdale, Lithonia, Lovejoy, McDonough, Hampton, Conyers, Avondale Estates, Red Oak, Fayetteville, Redan, Scottdale, Stone Mountain, Clarkston, Pine Lake, Union City, Sunny Side, Locust Grove, Norcross, Fairburn, Tucker, Covington, Griffin.